There aren’t too many solo games out there. Many games have variants that let players get in a solo game (Mage Knight: The Board Game, Suburbia), but games for only 1 person are few and far between. The only one that I own is the excellent deck building game Friday. 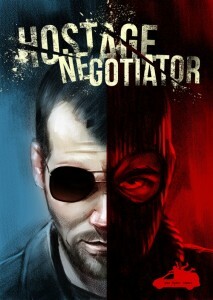 To help buck that trend is our newest Kickstarter of the Week: Hostage Negotiator. Based off the excellent Samuel L. Jackson movie The Negotiator (OK, not really), Hostage Negotiator puts players into the role of a negotiator who has the burden of talking to an abductor and trying to talk him down before he does something bad to his hostages. Object of the Game: Your goal as a Hostage Negotiator is to save the hostages and have the crisis end with the Abductor’s capture or elimination. To win, at least half of the hostages must escape with their lives AND the Abductor must be captured or eliminated. 1. The Conversation Phase – this is where you play and resolve conversation cards from your hand by making a Threat Roll to influence the Abductor’s Threat Level, earn Conversation Points, and save hostages. 2. The Spend Phase – this is your chance to spend any Conversation Points you may have earned in the Conversation Phase. 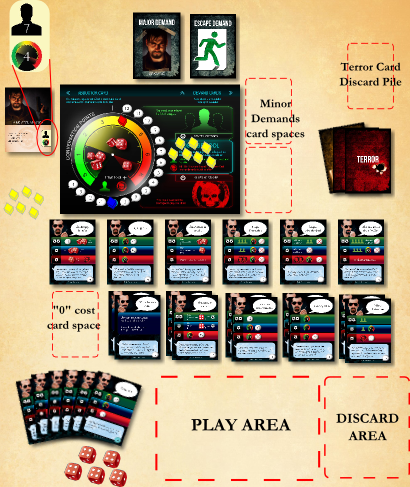 Similar to a deck building game you will buy cards from the available area on the table, but in this game all the cards you buy go directly into your hand for use in the next or another future turn. 3. The Terror Phase – this is where you will draw and resolve a Terror Card. In general, bad things will happen putting pressure on the Threat Level or worse… losing one or more hostages. The above is only a general summary of play, but we hope it gives you a good idea of the game. There are other details not discussed here such as Demands, the Pivotal Event Terror Card, the 2nd in Command, and more! The campaign page has a download link for the full rules if you want to check out how to play. There are also link to reviews from 3rd party sites as well as game over videos. If you’d like to become a backer, a $20 pledge will get you a copy of the game and any stretch goals. Hostage Negotiator is scheduled to be in backers hands in February of 2015 and you have until Sunday, August 10th to become a backer. So head over today and check it out.